← So much wisdom in so few words. 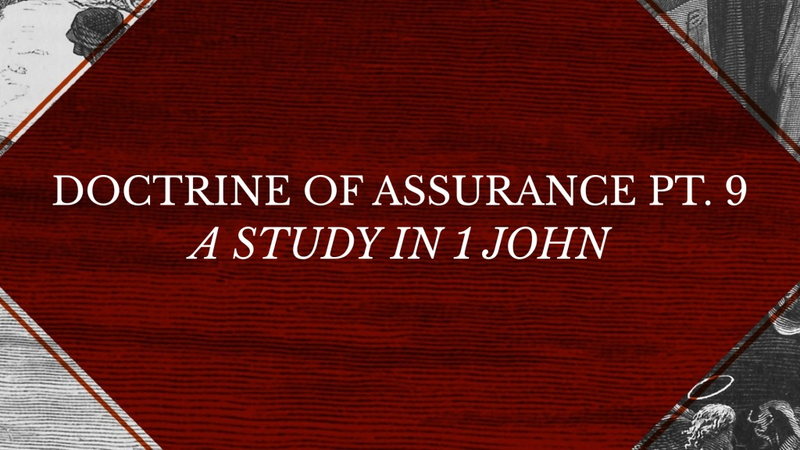 After a good many weeks, we’ve finally come to our last installment in investigating the doctrine of the Believer’s assurance of salvation out of the letter of 1 John. And we have seen over and over that such assurance can be well established by examining our relationship to certain things John has put our eyes upon. Perhaps it is clearer to say that assurance can be established by the change in certain relationships. The genuine Christian has had a spiritual change of citizenship which radically alters the key relationships we’ve been looking at. When my Dad gave up his Canadian citizenship and became a naturalized citizen of the United states – his relationship to both nations changed radically. He gained certain rights and privileges here, and gave up certain rights and privileges there. And so it is for the Christian. Formerly we related to this present world a certain way, and to the things of God a certain way – until we were born again – adopted into God’s family and received citizenship in the Heavenly city to come – the New Jerusalem. It brought us into a host of new relationships – some of which we are more aware of or take more advantage of than others. Nevertheless, it is this fundamental change in these relationships which serve to give us a full assurance of our new status in Christ. So far we’ve examined 7 of those relationships, and this morning we’ll look at the 8th. Where once we saw the Bible as perhaps interesting or even holy literature – now, we treasure it and receive it truly as God’s Word to us – inerrant and authoritative. We used to relate to God as an idea or perhaps as Creator, but now we are His adopted children having believed the Gospel and being reconciled to Him through the blood of Jesus. Once we gave little thought to sin and did as we pleased. Now we recognize sin as an abhorrent offense against our Heavenly Father, and something we want to be rid of – and fight. It used to be God’s people, those Church people – the born-againers were just a bunch of oddballs – perhaps nice, but oddballs just the same. Now, those oddballs are family – odd as they still are – and odd as I am in being linked to them. I used to think just like the world did about money, success and happiness. Now I find a whole new set of values that aren’t dependent upon what everyone else around me places importance on. I have new treasures they know nothing about. I used to have a certain set of beliefs and opinions, but now the Holy Spirit has birthed convictions in me regarding who and what Jesus is and what He did for me on the Cross that are as real and tangible as my own existence. I can’t shake the truth of them. And where once I lived like this life is all there is – a new dimension has burst upon my consciousness – and I have this longing and sure hope in my own resurrection from the dead to dwell with God eternally – because Christ has been raised from the dead. If you are one struggling with the assurance of your own salvation, I implore you to stop and consider whether some if indeed not all of these changed relationships are true for you – at least in SOME degree. Maybe none are as full as you might like, but you can detect this new reality. These form a solid foundation for one to have a sure sense of their salvation. But there is one more we need to look at today. One that is seemingly very subtle, and yet in truth is extremely weighty. It is the Believer’s new relationship to prayer. More precisely, it is the newly instilled: Instinctive recourse to prayer on behalf of the spiritual state of others, especially in regards to saving faith. I write these things to you who believe in the name of the Son of God, that you may know that you have eternal life. And this is the confidence that we have toward him, that if we ask anything according to his will he hears us. And if we know that he hears us in whatever we ask, we know that we have the requests that we have asked of him. If anyone sees his brother committing a sin not leading to death, he shall ask, and God will give him life—to those who commit sins that do not lead to death. There is sin that leads to death; I do not say that one should pray for that. And as you see here – this portion has 2 parts. The first part references prayer by itself. But the 2nd connects prayer specifically to the spiritual condition of others. Let’s unpack them in order. John’s 1st point here is that while he has written this letter to help Believers KNOW they have eternal life now, such an assurance leads also to confidence in prayer. a. Our confidence in prayer isn’t located in the act of prayer or in the power of prayer by itself – as though prayer has some magical force behind it. This is the superstitious idea of prayer which is often promoted. Jesus addressed this in the Sermon on the Mount. Those outside of Christ (and sadly even some who claim to know Jesus savingly) imagine that repetition of prayer and using certain phrases in prayer is the key to its effectiveness. Now it becomes a superstitious mantra – for the Bible teaches no such thing. We might ask why when Jesus’ disciples asked Him to teach them to pray, He taught them His prayer rather than the prayer of Jabez! We can add to praying some formulaic prayer getting numbers of people praying as though prayer is a matter of mathematical statistics. Get enough people to pray the same thing at the same time enough times and ZOWIE! The universe answers. No! Jesus makes the same point here John does. It isn’t the praying that is the key – it is the Father we pray to. Our confidence in prayer is confidence “toward Him!” It is in the God we pray to and based upon the relationship we have to Him as His children in Christ. Our confidence isn’t in some mystical power of prayer as an activity – but in the knowledge that having been reconciled to God through the blood of Jesus – having believed the Gospel and been born again by His Spirit – we are His adopted children and He hears us due to that relationship. Now does this mean we have to always discern God’s secret will before we can ever ask for anything? It DOES mean we stop to consider if what we are asking is contrary to anything revealed in His Word. We do not want to be praying for what we know full well His Word would forbid. But more, the idea is this: We can so trust Him to always act out of His perfect, love, wisdom and holiness on our behalf, so that after making our request known – we can leave it up to His perfect disposal. In other words, we trust Him to know better than we do, and to answer better than we know how to ask. That, Beloved, is praying in faith. Praying with our confidence in Him, rather than having confidence in our own defective understanding. I can tell you from personal experience that when we begin to pray like this – we begin to see His hand working in all sorts of ways we would never have imagined. AND – we will find a willingness in Him to answer in ways that I would label more “favors” than anything else. More and more I will pray: Heavenly Father, here is the issue, and here is what I would like to see happen. But you know better than I what will be best for me and everyone involved – so I commit it to you. Sometimes He answers exactly as I ask. Other times He answers according to His better wisdom and more perfect love. But He always does what is best – for all involved. Always. He can be trusted. The more we trust Him and His character with our prayers, the more we enjoy fruitful and bountiful answers to prayer. Praying this way – we KNOW we have the requests that we’ve asked of Him. We have this amazing new relationship to prayer. Prayer isn’t all about cosmic arm twisting to get God to do what we want. Let me use the right formula. Let me get lots of people to make the case for me. Let me chant it over and over. Let me say it louder and louder. Let me couple it with deal-making vows to bring Him around. It is instead a deep and abiding confidence in the love, holiness and wisdom of the One who loves me so. But what does all of this have to do with an assurance of salvation? First, the more we see answered prayer, the more we grow assured of our relationship to Him. But the main idea here is found in the 2nd part of our text – and that in a most interesting way. The first thing to notice is how praying here is specifically tied to interceding on behalf of a brother or sister in Christ who is caught in a sinful pattern of life – and how we are encouraged both to pray for them, and to expect deliverance for them. It is quite an unqualified guarantee isn’t it? Very few things in Scripture come with this sort of certainty when it comes to prayer. The promise here is that intercession on behalf of fellow Believers caught in sin is uniquely effective. I find that so encouraging and amazing. I am so grateful for this statement. And it greatly informs my prayers for others like few other things do. John gives us a fantastic example of loving the brethren here: Praying for one another in regard to their sins. Oh what a powerful ministry. Few promises in God’s Word are so stated with such certainty of response in prayer as this. If you can’t do a single other thing to contribute to the spiritual growth and health of your brothers and sisters in Christ – you can do this: Pray for their success in their struggle against their sins. And is there anything more contrary to a condemning spirit than to take up their struggle with them in prayer? Now if we ask about the “sin leading to death” – there is some mystery here. Obviously, John saw no need to elaborate on it for his first readers. He assumed they knew it without explanation. The most common take on it is that John is referring to the unpardonable sin of Matt. 12 where Jesus makes it clear that blasphemy against the Holy Spirit unpardonable. In the context of that passage we find out that for one to knowingly attribute the miracles of Jesus to the Devil in order to turn people away from Him, will not be forgiven. Appropriately then John mentions here that such sin we are not to pray for since we know it is the Father’s will not to forgive it. But all other sins? Ah, here we have a most precious and powerful ministry we can partake of. In fact every Believer can enter into this ministry, no matter how young, how old, how infirm; no matter how unable to bless the Body of Christ in any other way. Amazing. But again, how does this apply to us gaining an assurance of our salvation? And the answer is in this: All sorts of people pray for all kinds of things. But here, the issue is not about the activity of prayer, but about the instinct of prayer. What is wholly unique to the Believer is this: A focus in prayer upon the spiritual needs of others above their mere circumstances. Truth be told, those who are outside of Christ know absolutely nothing about praying either for the salvation of their loved ones, nor about their spiritual walk with Christ at all. It simply isn’t to be found anywhere in their wheelhouse. Because they have no reality of salvation from which to draw such a concern. The point is what I stated at the outset this morning: This Instinctive recourse to prayer on behalf of the spiritual state of others, especially in regards to saving faith. This is something only a true Child of God possesses. It cannot belong to the lost in any way since they have no reality of salvation to use as a reference point. It simply is not, cannot appear on their radar screen. And if I might share a wonderful recent example of this in action, we had the most precious experience of it last week in our small group. As we shared a time of prayer together, what became the focus of every prayer was this: We prayed that our loved ones would be delivered from darkness, and come to saving faith in Jesus Christ. Beloved, no one who is not a child of God ever cared to pray that, and never will. They do not understand it. It makes no sense. They might pray for deliverance from destructive lifestyle choices and decisions; for healing; for financial stability; for correcting a bad situation; for a million and one other things: But to pray that their souls would be reconciled to God through the Cross of Christ – it simply isn’t there. It can’t be. Such concern over the spiritual state of a loved one that they might trust in Christ for salvation is the wholly and sacred domain of those who are truly Christ’s. And the instinct to pray in this way, is proof that a genuine work of saving grace has been wrought in your heart. If this is your burden, then you have one of the most powerful and concrete demonstrations that you are truly Christ’s that you can possibly have. And when you add it to all the others, together they form a foundation for being assured of your saved state as can possibly be granted from the whole of Scripture.